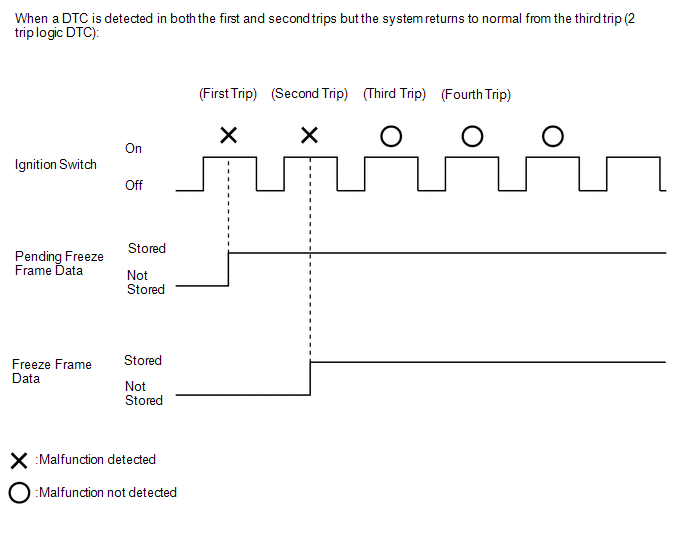 If it is impossible to replicate the problem even though a DTC is output, confirm the freeze frame data. The ECM records engine conditions in the form of freeze frame data every 0.5 seconds. 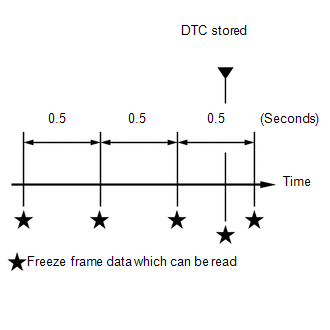 Using the Techstream, 5 separate sets of freeze frame data, including the data values at the time when the DTC is stored, can be checked. 3 data sets before the DTC is stored. 1 data set when the DTC is stored. 1 data set after the DTC is stored. These data sets can be used to simulate the condition of the vehicle around the time of the occurrence of the malfunction. The data may assist in identifying the cause of the malfunction, and in judging whether it was temporary or not. Pending freeze frame data is cleared when any of the following occurs. Using the Techstream, the DTCs cleared. 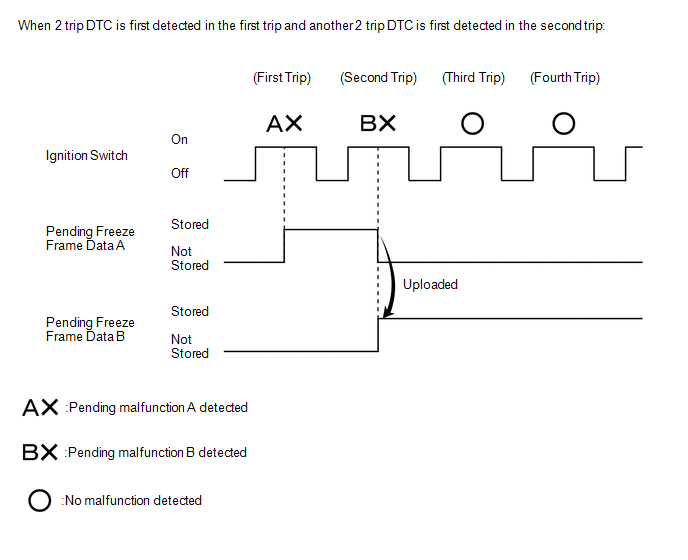 With previous pending freeze frame data stored, if pending freeze frame data is newly stored when a 2 trip DTC is detected in the first trip, the old freeze frame data will be replaced with the new one of the newly detected DTC in the next trip. The load calculated by the ECM. The load percentage in terms of the maximum intake air flow amount. The VG circuit is open or shorted. The throttle opening angle recognized by the ECM. The calculated value based on VTA1. The quantity of fuel injection volume for 10 times. The order signal from the ECM. Short-term fuel compensation is used to maintain the air fuel ratio at the stoichiometric level. Overall fuel compensation is carried out in the long-term to compensate for a continual deviation of the short-term fuel trim from the central value. ON: When the throttle valve is fully closed and the engine speed is more than 2800 rpm. The fuel cut is being performed under a very light load to prevent incomplete engine combustion.